We’re human. We’re programmed for instant gratification. Using this principle, Discovery Health has built its very successful Vitality programme, which is a blueprint for other rewards schemes, not only in healthcare, but other sectors too. Free smoothies or wearable tech for doing a daily dose of exercise or changing your eating habits is not just Discovery Health being Mr Nice Guy. There is an ulterior motive, albeit a well-intentioned, strategic one. The company is using behaviour modification to build a shared value business model, which is sustainable. So, in a nutshell, Vitality rewards members today to bend the mortality curve for longer-term risk mitigation, he says. 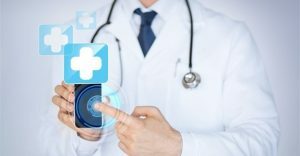 There’s been a massive and rising investment in digital healthcare, particularly along three themes, namely telemedicine, enterprise software and business-to-consumer interface, he says. He touches on telemedicine, but speaks very enthusiastically about the other two themes, probably because of the amount of capital Discovery Health has ploughed into them. Fragmentation and a lack of care coordination are costing medical aids. For instance, diagnostic tests are often repeated in the chain of care. A GP may order a blood test to confirm a diagnosis before referring a patient to a specialist, who will repeat the same test because he or she does not have access to the results of the prior test. The same goes for providing a medical history. A patient generally has to complete the same paperwork at each practitioner he or she visits, which creates unnecessary admin work. There have also been situations where patients have forgotten to mention information that could have implications on treatment protocols. So, Discovery Health is developing a centralised electronic medical records platform where practitioners can access patient information (with the patient’s permission, of course) and get a full medical history at a touch of a button, he explains. Noach is excited about Discovery Health’s new digital healthcare platform, DrConnect, which the company will be launching shortly. This is a predictive artificial intelligence (AI) engine which “glues doctors and patients together and provides contextual and meaningful information. AI is going to change doctors’ jobs. It’s patient-centric and allows them to manage their own care,” he says.